It’s time to take a look at the mightiest of the meatiest. These are the beasts of the working world – the best large trucks. These are the trucks that can be beat on, roughed up, rolled out, smacked down, and worked over, then respond with, “Is that all you got?” They’re built for hauling, towing, plowing, moving, or just plain gettin’ dirty. They’re the symbol of blue-collar workers the world over. We’ve taken research from Car and Driver, Consumer Reports, Edmunds, and Motor Trend, to find out which ones are the best of the behemoth class, the best large trucks of the 2010-2011 model years. 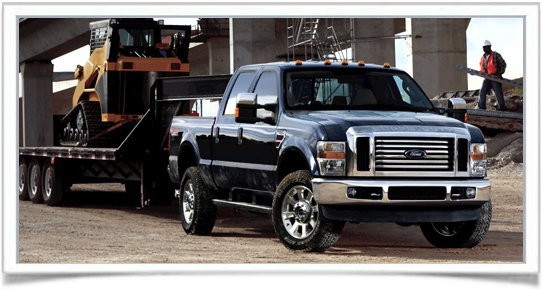 When it comes to large trucks they don’t get much larger than the F-450 Super Duty. They also don’t get much better. The 2011 model has been given a total refresh with a new 6.7L turbodiesel V8 engine that pumps out 400 horsepower and an astounding 800 lb-ft. of torque. This massive rear-dual-wheeled monster has a maximum towing capacity of 24,400 pounds and can haul a payload of up to 4,920 pounds at the same time, when properly equipped. Drivers can also lock out higher gears to optimize towing performance. The base model interior is really a workman’s interior, strung with hard plastics and an industrial theme. However, if you upgrade to the Lariat or King Ranch models, you’ll have more upscale amenities and a plush leather interior. You’d never know it by the outer appearance, but the 2011 Silverado 3500HD is totally redesigned underneath. A stronger frame, new diesel engine, and several electronic driver aids are just a few of the many subtle changes. You still have the option of the standard 6.0L V8, but Chevy has also given the Silverado a new 6.6L Duramax turbodiesel V8 as well. Workers will want to go with the diesel as it ups horsepower slightly and raises torque significantly, going from 380 lb-ft. to 765 lb-ft. Towing capacity is a whopping 21,700 pounds when properly equipped, and payload capacity is one of the best in this class at 6,355 pounds. The diesel engine also features an exhaust braking system to increase vehicle stability and reduce break wear when stopping. 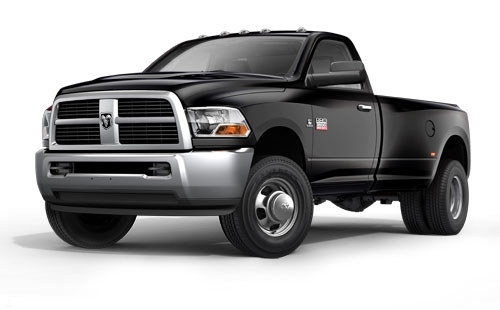 Despite a 6.7L Cummins turbodiesel V8 engine, the Ram still lags behind the Ford and Chevy in both power (350 hp and 650 lb-ft. of torque) and towing capacity (17,600 pounds when properly equipped). Its strength lies in its interior, which is the best among all pickups. Soft materials, strong stitching, comfortable seating, and metallic accents highlight a cabin that was built to be anything but a working man’s office. Controls are easy to reach and user-friendly, and interior storage spaces are ample. All this makes it one of the most comfortably-riding trucks anywhere, even when performing the most rugged of duties. Though not quite as big as the other big boys, the Tundra can still hang in the large class of working trucks. Its muscular 5.7L V8 engine is good for 401 lb-ft. of torque and can tow up 10,800 pounds when properly equipped. 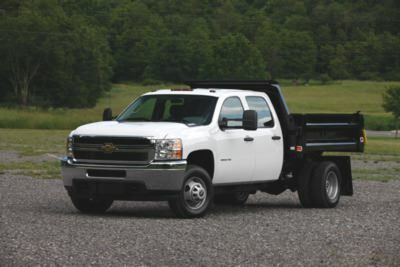 It possesses enough power to make it a solid working truck, but not enough to rank it any higher on the list. Still, it features a comfortable cab, impressive acceleration, and a nice off-road package that makes it meaner than it looks. Still, it is only a half-ton truck, so think of it as the baby brother of the class.